I&apos;ve been eagerly anticipating a tour of JT Shrimp LLC in Wheatfield, so I&apos;ve been doing some research on domestic shrimp farming, or aquaculture, as it&apos;s known in the business. 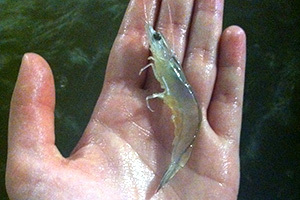 I discovered that there are only a handful of shrimp farms in the state of Indiana - and I&apos;m lucky enough to have one just a few miles away from my home! My friends, Scott and Leslie Tysen, have been updating me regularly on the progress of their new shrimp farming venture, so I was really excited when they invited me to take a tour of their facilities! Located in rural Wheatfield, JT Shrimp is situated on Scott and Leslie&apos;s farm. They erected a new building last fall and have been working hard to get everything up and running. My daughter, Jenna, and I, along with our friends, Shania and Martin, headed out to Wheatfield last week for a tour. We were greeted warmly by Scott and Leslie and spent a few minutes in the office area catching up and learning about how the farm operates. Before we headed into the ‘pool room,&apos; Scott warned us that we might want to take our sweatshirts off. "Unless you never sweat," he joked. When we entered the room, we quickly understood the reason for Scott&apos;s warning. It felt like a sauna! The room contained what appeared to be eight large blue swimming pools. Four of the pools had aerators that pumped a constant spray of water back into each pool. Scott explained that the other four pools were awaiting chemically accurate water and a delivery of shrimp. Leslie said that if we wanted to touch the shrimp, we needed to wash our hands thoroughly, so we headed back to the office to scrub up. We couldn&apos;t wait to stick our hands in those pools! Scott grabbed a net and scooped out some of the larger shrimp so we could see how big they were getting. I was surprised to see how active they are! Scott said that he had one jump clear out of the pool a few days ago. We enjoyed putting our hands alongside the edge of the one of the pools - the shrimp felt like they were tickling our fingers! Martin got to hold some food and had shrimp eating out of the palm of his hand. 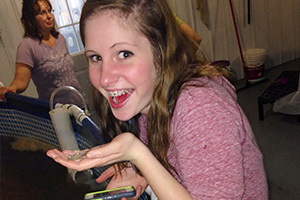 Jenna was especially amused by holding a shrimp; Shania was just happy to take pictures. Scott did a great job explaining the process of shrimp farming to us. He said that they are hoping to have their first harvest in May and that when they reach full capacity, the pools will hold more than 50,000 shrimp. Leslie explained that they are working on the tour aspect of the business. They hope to bring in school groups, as well as individuals, to learn about shrimp aquaculture. They have already purchased plastic benches so that the smaller children can see over the edges of the pools. As much as we enjoyed our tour of the ‘pool room,&apos; we were utterly fascinated by the fish tank in the office! Scott showed us how shrimp eat and digest their food. 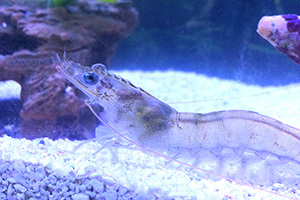 He dropped small pellets of shrimp food into the water. When the food settled on the bottom of the tank, the shrimp sucked them into their mouths. 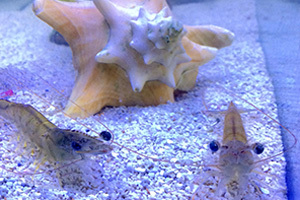 Since shrimp are transparent, we could actually see the pellets being moved into their digestive tracts! It was amazing. We thanked Scott and Leslie for the fantastic tour and headed toward the car. Leslie told us to come back another day when the ground wasn&apos;t as muddy so that we could see calves that were born recently on their farm. We can&apos;t wait to go back!